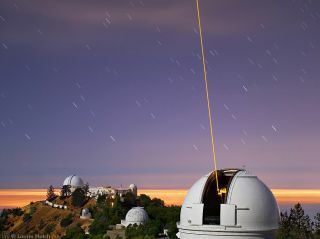 A laser guide star for the adaptive optics system at the University of California's Lick Observatory lights up the night sky in this view by photographer Laurie Hatch. Tech giant Google will give $1 million to Lick Observatory, a University of California facility that has been battling for funds since 2013. The money will go towards general expenses for the next two years and will supplement the $1.5 million annually that the Lick Observatory receives from the university. "This is very exciting," UC Berkeley astronomy professor Alex Filippenko, who leads fundraising, said in a statement on Feb. 10. "There's a real opportunity to make a difference, through the research, education and public outreach we do at Lick Observatory." Two years ago, the university threatened to cut off funding in 2018 amid overall budget cuts. It reversed that decision late last year, but said it would reduce the allocation it gives to the observatory. The new grant will temporarily boost Lick's budget to $2 million annually, which is still below the $2.5 million it used to receive from the university. Filippenko said the money would buy time for the observatory to look for more money, which he is hoping will come in the form of a $50 million endowment. Interest from the endowment would go towards annual operating funds. The observatory was established in 1888 and has seven telescopes at its Mt. Hamilton facility near San Jose. These telescopes perform a wide variety of science observations, from studying supernovas to searching for alien planets. Their modest size allows for researchers to do repeat observations, Lick officials added, because larger telescopes have tighter time allocations due to the popularity of observing requests. Prominent work at Lick includes discovering most of the first 100 exoplanets, finding black holes embedded in galaxies, and discovering or studying supernovae that were later used to show that the universe's expansion was accelerating. The telescopes have also been used to test technologies. One example is adaptive optics, a technology that uses lasers to adjust a telescope mirror to account for turbulence in the atmosphere. This allows for sharper images of stars, galaxies and other objects. Separately, Lick recently received $350,000 to upgrade a spectrograph on its three-meter telescope. The change will make it easier to examine supernovae and other distant objects, Lick officials said. Those funds came from the Heising-Simons Foundation and donors Bill and Marina Kast.